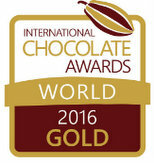 In both 2015 & 2016 tens of thousands of chocolates from over 40 countries were judged by world class chefs, sommeliers and food experts at the International Chocolate Awards. Iain Burnett's signature Velvet Truffle took home the Gold each time. The Dark Velvet Truffle Single-origin São Tomé Dark chocolate and fresh Scottish cream expertly balanced. The Caramel & Liquorice Velvet Truffle Caramelised White Chocolate ganache with a touch of liquorice root.